Photo credit: Kiosko screenshot Sunday Express. The British pound suffered its biggest fall in two years this week when Brexit minister Dominic Raab quit his post on Thursday as he felt defending the Prime Minister’s Brexit deal was untenable. Mr Dominic Raab was seen as a promising prospect to become Prime Minister himself one day and even though Ms May’s government lost four more cabinet members that day, none was perceived so damaging as his departure. Related coverage: <a href="http://thegoldwater.com/news/42562-Brexit-Tories-Are-Stuck-In-The-Middle-With-EU"> Brexit – Tories Are ‘Stuck In The Middle’ With EU</a>. As it stands, no one in their right mind in the UK believes that the victors of this week are the British Isles. Should they accept the Brexit deal negotiated by their PM, they will basically have to pay up 40 billion Euros and stay in the customs union for the next three years, unable to negotiate any of their so desired trade deals with the rest of the world and having to accept whatever the EU decides. The winner of this week’s negotiation round was undoubtedly Michel Barnier, the French negotiator in Brussels. German Chancellor Angela Merkel echoed that victory when she declared on Friday already that the EU would not re-negotiate what was on the table. However, Mr Dominic Raab disagrees, claiming that if a deal could not be closed "on reasonable terms we need to be very honest with the country that we will not be bribed and blackmailed or bullied, and we will walk away". He also warned against looking "like we're afraid of our own shadow." "I think there is one thing that is missing and that is political will and resolve," he said. "I am not sure that message has ever landed." 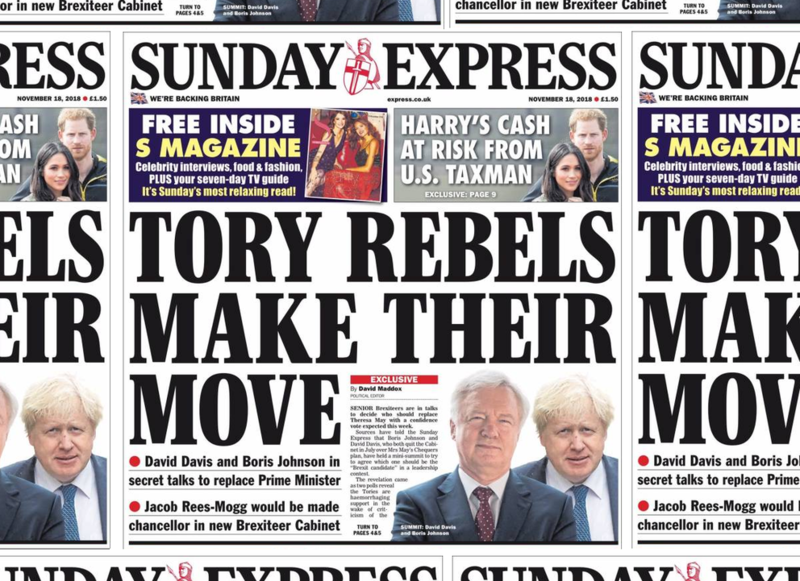 Meanwhile, the Sunday tabloids are convinced that several senior Tory members are working out a plan to oust PM May this week and replace her with either Mr Boris Johnson or Mr David Davis. In that case, Mr Jacob Rees-Mogg would then become chancellor in a Brexiteer cabinet. The one who doesn't make No.10 should then become Home Sec.